Maria and her 8-year-old son, Samuel, who is sponsored by Curtis and Susan from Louisiana, share a tender moment outside their home in Colombia. A mother looks out at her neighborhood as the light creeps over the mountains, the crowing of roosters filling her ears. Her home sits high on a mountain, the city of Medellín sprawling before it. The mother’s eyes pass over the half-finished wall at the front of her house. She and her husband have been building their home a little at a time over the years, and now have four finished rooms and a bathroom with running water. She turns from the waking city and enters her home, ready to start breakfast. But first she peeks in at her four sleeping children in their shared bed. Soon they will be awake and getting ready for school. A soft beeping fills the room as the mother turns to the cooktop. She takes her phone from her pocket and sees a small light flashing to indicate a new message. The mother smiles as she reads the message. 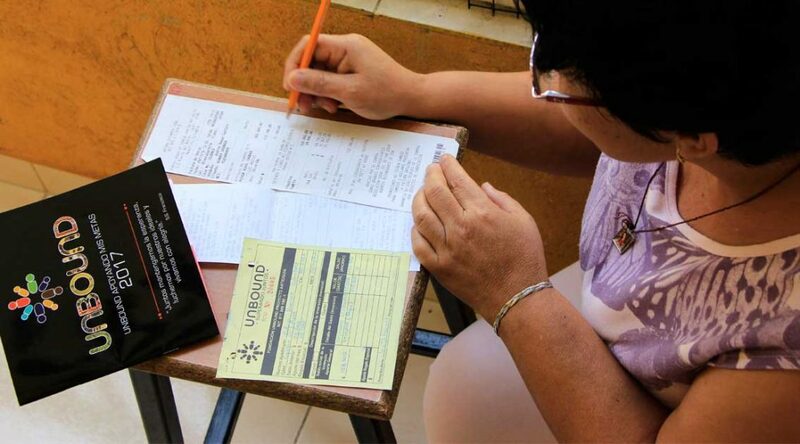 The monthly benefit money from Unbound was just delivered to her child’s sponsorship account, and she and her family already have a plan for how to use it to better their lives. Gloria documents how she’s utilizing her son’s sponsorship benefits in her “Supporting My Dreams” booklet. Families use the booklet to record their goals and plans for how they want to use sponsorship benefits. Gloria’s son Juan, sponsored by Vanessa in Texas, wants to become an engineer. Since Unbound was founded in 1981, our sponsorship program has transformed in many ways, including how benefits are delivered to sponsored members. In the early years, we partnered with institutions such as schools and orphanages, which were already operating in the countries of our sponsored families. This meant that benefits mostly went toward schooling, food and clothing. We realized there might be ways to create an even bigger impact for the families in community-based programs, outside of the institutions. As Unbound transitioned out of institutions into our own freestanding program offices with our own staff, the benefit model evolved. In many areas, mothers began meeting in support groups on a regular basis. This led to a bulk-buying model, in which mothers would vote on the types of benefits they wanted their children to receive and the staff would buy them in bulk. But even though mothers could choose something else, like food or medicine for a sick child, instead of that month’s bulk benefit, this method of benefit distribution still didn’t allow for much personalization. “Many times we had needs and had to cover them and Unbound would give us the same type of benefit, … so we ended up having two of the same,” said Gloria, mother of 14-year-old sponsored child Juan from Colombia. Unbound believes it’s important to make sponsorship benefits highly personalized. It’s something we’ve been evolving toward since our inception, but have been intensely focused on in recent years. and depositing sponsorship funds into individual child bank accounts. Of these three, individual child accounts, also known as conditional cash transfers (CCTs), allow for the most personalization and give the greatest flexibility to the family. Our Antioquia program, based in Medellín, Colombia, has one of our most highly developed CCT models. Each month, Antioquia staff transfer sponsorship benefit funds into individual child accounts, and the account holders, typically mothers of younger children, receive notification via text messages that the funds have arrived. The staff started training families on the new process in October 2014, and the first transfer was made in January 2015. Program coordinator Diana Patricia Lopez Rios said the change in the way sponsorship benefits are delivered has been positive for families. Diana Patricia López Rios is a program coordinator in Colombia. She’s one of the many staff members working with families to identify goals and make plans for how they want to accomplish them. Maria hems a pair of jeans on her sewing machine.She brings in a small income by doing alterations from home. Maria checks her phone for the notification that sponsorship benefits have been delivered to her son’s account. As parents are intimately familiar with the needs of their children, they are in the best position to determine how best to use sponsorship benefits. Mothers meet in small groups and individually with Unbound social workers to receive training and make plans for how the Unbound program can best benefit their children. Each family has a booklet in which they record their family goals and the sponsored child’s personal goals, and there’s space to write how they plan to invest their benefits to reach those goals. 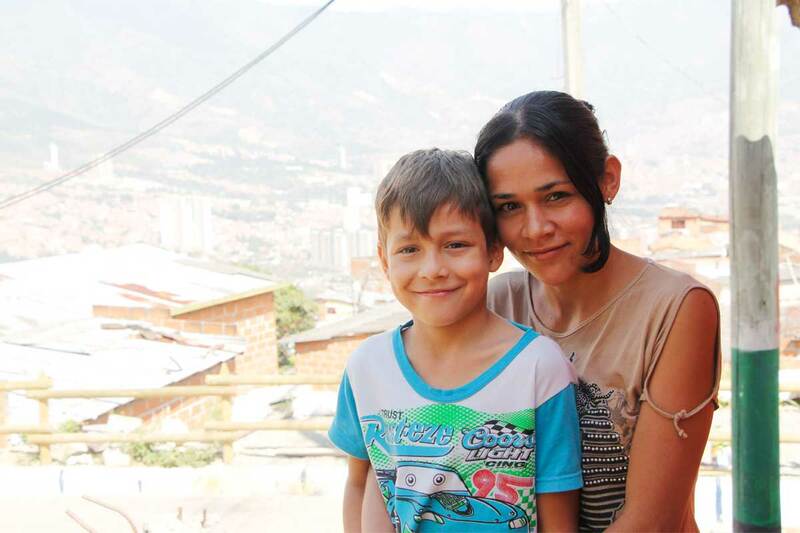 Maria is a young mother of four in Medellín who has training in design and dressmaking. Her son Samuel is sponsored through Unbound. She makes some money doing alterations from home. Her husband, Ledys, is a construction worker, but the work is not steady. Maria’s family provides a good example of how child accounts create space for families to set short-term and long-term goals. Child accounts are important because they help empower families to lift themselves out of poverty. Jordan joined the Unbound family in 2011, after completing her master’s in English: Creative Writing from Kansas State University. Jordan is constantly inspired by the hope and creativity displayed by the sponsored members and their families and loves being able to share their stories with the rest of the world. Jordan lives in Kansas City, Missouri, with her cats, Mina and Isabeau, and can often be found playing board games with friends.